Make the cookies: Sift 3 cups of flour, the ginger, cinnamon, baking soda and salt into a large bowl. Beat the butter in the bowl of an electric mixer at medium speed until smooth and creamy, about 2 minutes. Add the brown sugar and molasses. Mix until combined. Beat in the egg and vanilla. Add the flour mixture to the butter mixture and mix until a thick dough forms. If the dough is sticky, mix in the remaining flour a little at a time until the dough can easily be handled without it sticking to your fingers. You may not have to use all of the flour. Gather the dough into a ball; divide in half. Roll each dough piece flat to 1/4-inch thickness between parchment paper sheets. Transfer the dough inside the sheets to the refrigerator to chill for 30 minutes. Position a rack in the center of the oven; preheat to 350 degrees F. Line 2 baking sheets with parchment paper. 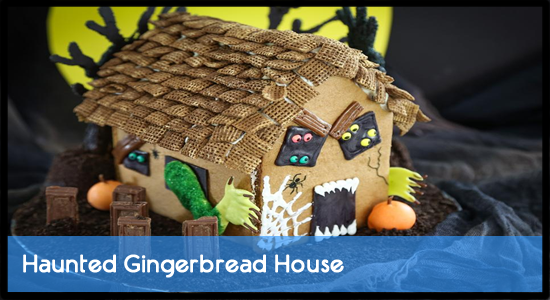 Print the Haunted Gingerbread House Walls and Roof Template and cut the shapes out with scissors. When the dough is well chilled, remove it from the refrigerator and peel back the top sheets of parchment. Lay the templates on the dough and cut around them using a flat-edged knife (do not discard the templates). Transfer the dough shapes to the prepared baking sheets. Leftover dough can be re-rolled and cut into cookies, or you can shape it into a baton and store it in your freezer for up to 1 month. Bake the shapes for 15 minutes, or until lightly golden around the edges. While the cookies are still warm, lay the templates on top of the baked cookies and re-cut them using a knife. This will help the shapes fit together perfectly when you are assembling the house. Assemble the house: Place the white candy wafers in a heatproof bowl and cook at 100 percent power in the microwave at 30-second intervals. Stir well after each interval until the candy is smooth (this should take about 1 minute total cook time). Transfer the candy to a disposable piping bag with a small hole in the end snipped (you may also use a zip-top bag with the corner snipped). Use cans from your pantry to help prop the house pieces up as you work. Glue the sides, front and back of the house together using the white melted candy. Let stand until dry, about 10 minutes. Meanwhile, prepare the landscape: Spread half of the chocolate frosting over a 14-inch cake board or serving platter. Sprinkle the surface with the cookie crumbs and press them down slightly with flattened palms. Save leftover cookie crumbs and frosting for later use. When the candy holding the gingerbread walls together is dry, gently lift the assembled house and place it in the center of the prepared board. Pipe white melted candy along the top edges of the house and attach the roof; hold the pieces steady with your hands until they hold on their own, about 2 minutes. Pipe extra candy around the roof edges and walls to fill in any visible gaps. Place the corn cereal in a bowl or zip-top bag and add the cocoa powder. Mix together until the cereal pieces are well coated with cocoa. Pipe a line of candy on the bottom edge of a roof piece and place cereal pieces end-to-end in a single layer to make roof tiles. Pipe another line of candy just above the first row of cereal and add another row, slightly overlapping the first. It’s okay to use broken cereal pieces, as this will add to the character of the haunted house. Cover the entire rooftop with cereal. Pipe candy on the front and back top edges of the house and line with cereal squares. Allow the house to stand at room temperature until the candy is set, about 15 minutes. Make the windows and door: Print the Haunted Gingerbread House Windows Template (link below). Place the template on a flat work surface and cover it with a large sheet of parchment or waxed paper. Melt the black candy wafers in a heatproof bowl and cook at 100 percent power in the microwave at 30-second intervals. Stir well after each interval until the candy is smooth (this should take about 1 minute total cook time). Transfer the candy to a disposable piping bag with the tip snipped. Pipe the candy over the black boxes (windows and doors) on the template. Use a toothpick to push the candy into small corners and to fill in gaps. Make as many windows as you wish for your haunted house by moving the template under a new sheet of parchment paper. Place candy buttons in each of the smaller windows before the candy is set. Use a food color marker to draw on eyeballs. Allow the candy to stand until set, about 15 minutes at room temperature or 5 minutes in the refrigerator. Peel the candy boxes with eyes off of the parchment and use a little melted candy to attach them to the top front of the house. Position each window tilted inward slightly. Attach the larger candy rectangle below the 2 windows to create the door. Use the white melted candy (reheat if necessary) to pipe dots on the top and bottom edges of the door. Use a toothpick to pull the melted candy into points to create fangs. Make the monster arms: Melt green candy wafers as previously directed with the white and black candy wafers. Transfer the candy to a disposable piping bag with the tip snipped. Lay a sheet of parchment on a work surface. Pipe a 4-inch L shape on the parchment paper with the green candy. Use a toothpick to smooth the candy into an arm shape. Use the toothpick end to pull the bottom of the L shape into fingers. Pour green sanding sugar over the top portion of the arm, leaving the hand uncovered. Place a chocolate sprinkle on each finger to create long claws. Allow the shapes to set until firm. When the candy is firm, peel it off of the parchment and shake the excess sugar off of the arm. Repeat this process with a backwards L shape so that you have 2 monster arms. Attach a candy window with melted candy to each side of the house and hold until set, about 2 minutes. Attach an arm to each window and hold until set. Further decorate the sides and back of the house with more windows. Create boards for the windows: Knead 2 chocolate chews together and roll flat with a rolling pin (if the chews are too firm to flatten, heat them in the microwave for 5 seconds). Cut small board shapes (about 1/4 inch by 1 inch) from the candy using a knife. Use the end of a toothpick to striate the pieces. Use the pointed end of the toothpick to poke 2 small holes in each end, creating nail holes on the boards. Attach the pieces over the windows using melted candy. Make candy pumpkins: Carefully poke holes in the gumballs using a metal skewer or knife, and thread them onto the pointed ends of toothpicks. Melt the orange candy wafers as previously directed. Dip the gumballs into the candy and place them on parchment paper. Remove the toothpick. Use leftover chocolate chews to fashion small pumpkin stems. Place them standing upright on top of the pumpkins. Allow to stand until set, about 15 minutes. Make spooky trees: Line a baking sheet with parchment paper. Use the black melted candy (reheat as needed) to pipe 3 well-spaced lines on the cookie sheets. Place a rolled wafer cookie on top of each line. Use the black candy to completely cover the wafers. Draw tree branches with the candy coming off of both sides and the top ends of the wafers. Cover with black sanding sugar. Let stand until firm, about 15 minutes. Meanwhile, make the pretzel ladder: Break 2 of the pretzel sticks in half. Place 2 whole pretzel sticks parallel to each other. Attach the broken pretzel rungs to the whole pretzel sticks using melted candy. Let stand until set. When firm, lean the ladder against the house, preferably leading up to a window with eyeballs peering out. When the trees are firm, lift them from the parchment and shake away excess sugar. Place each snack cake on the cake board upside-down and press a candy tree in its center. Cover the snack cakes with leftover cookie crumbs, if desired. Make tombstones: Place leftover chocolate frosting in a piping bag. Break the chocolate bars at their perforations. Pipe a small dot of frosting onto the crumb-covered cake board and press an upright turned chocolate piece into the frosting. Repeat with remaining chocolate pieces to create a graveyard. Finishing touches: Use melted white candy to pipe spider webs onto the house. Use the food color marker to draw cracks on the house, and spiders near their webs. Place the pumpkin decorations on the landscape and around the house as desired.